If you or someone you love is sick and tired of feeling sick and tired, chronically depressed, in pain, addicted to drugs, and not feeling good enough about life in general, or lack a positive attitude to act in accordance with one's best interests and success, then CBD528 homeopathic is for you. It is public knowledge that cannabis extracted cannabidiol ("CBD") helps reduce pain and can benefit many medical patients. It is also public knowledge that certain Bach flower essences can remedy certain emotional patterns and help instill beneficial attitudes. Now we have a peer reviewed, double-blind, university study proving the "Frequency of LOVE 528Hz) is especially beneficial to alcoholics and others with immune system problems. (Read the study HERE.) Researchers discovered the '528 wave' increased anti-oxidant protection by 100%, and increased central nervous system nerve protection by 20%. Developed by Dr. Leonard Horowitz and psycho-social analyst, Sherri Kane, with this intelligence in mind, they created CBD528 as drug-free (and drug-freeing) homeopathic remedy expressly developed to put users into the "ZONE" of bliss--pain-free living, positive attitudes, success thinking, and healthy peaceful living. Dr. Horowitz is a world renowned retired dentist, oral surgeon, naturopathic physician, public health expert, and energy-medicine pioneer. He teamed up with psycho-social analyst and 'culinary alchemist,' Sherri Kane. Together they selected the best, purist, white crystal CBD hemp (cannabidiol isolate), even though they knew that the finished product was going to be free of any chemical CBD as a pure homeopathic. They knew homeopathic science involving 'structured water' memory was important. And they knew research proved the efficacy of CBD isolates (C1 and C2)(1) against a variety of illnesses; especially pain, depression, and emotional distress. And they knew homeopathic science taught how to extract those values "energetically." So they worked to formulate and manufacture a homeo-alchemical product that would generate the same beneficial effects of CBD on body, mind, emotions and spirit, but without retaining any of the chemical in the final product. They did this using Dr. Horowitz's pioneering discoveries in water science, OxySilver technology, and the Solfeggio frequency of "LOVE 528" to be most helpful and healing. They reasoned that the "resonance energy signature" of pure CBD, and the specific flower essences, along with 528 frequency, would deliver the benefits of a 'double super-conductor' of homeopathic resonance power. And they were right! Testimonies from users have been outstanding. However, because CBD528 acts SO POWERFULLY to remedy old patterns of self-defeating thoughts and psycho-social behavior habits, users often reported a rapid and dramatic "healing crisis" wherein these negative patterns were brought to conscious awareness for the first time to prompt permanent purging and behavior change. For this reason, it may be best to use CBD528 in combination with professional care. CBD528 did and does amazing things for a lot of users for a number of reasons. The cost is totally affordable. One bottle can help a person for years stay "in the ZONE of bliss," or be used to help many people since only 3 drops under the tongue produces results and is the recommended dose. Used during pain episodes or during emotional crisis to supplement professional care (if needed and desired) CBD528 can help people generally "detox" and extinguish their negative self-defeating pattern of thinking, feeling, and acting. This is great news, especially for intoxicated people, alcoholics, smokers, patients who are "over-drugged," and/or hard-pressed to afford expensive CBD products or professional care. As complementary or alternative medicine, CBD-free homeopathic CBD528, follows standard homeopathic protocols to deliver a better life for users, without adding more drugs or chemicals to sensitive bodies. 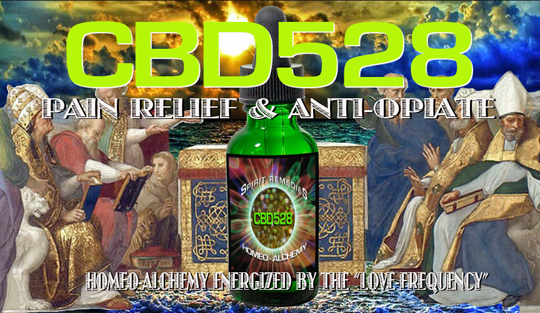 Click the button below to add the CBD528 Homeo-Alchemy to your wish list.